Rolling Blackouts takes you behind the scenes with journalists from the Seattle Globalist as they report from Turkey, Northern Iraq and Syria. Here, you’ll find links to the work by Seattle Globalist journalists referenced in the book as they come up in each chapter as well as a list of stories produced during the reporting trip. 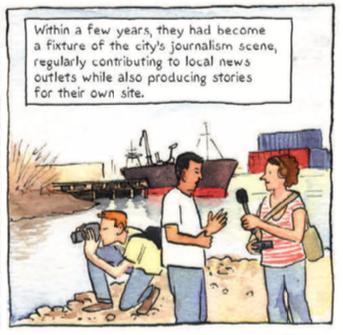 Page 13 panel 4: A good example of the Seattle Globalist's early Seattle area reporting (and the one pictured here) is the radio series Life on the Duwamish which was produced for KUOW, Seattle's NPR affiliate. 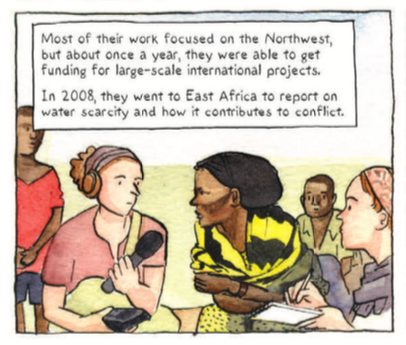 Page 13 panel 5: Water Wars: Ethiopia and Kenya was a series of articles, radio pieces, and photo/video journalism sponsored by a grant from the Pulitzer Center for Crisis Reporting. The stories produced for this project were published on Frontline, NPR, the San Francisco Chronicle and other media outlets. 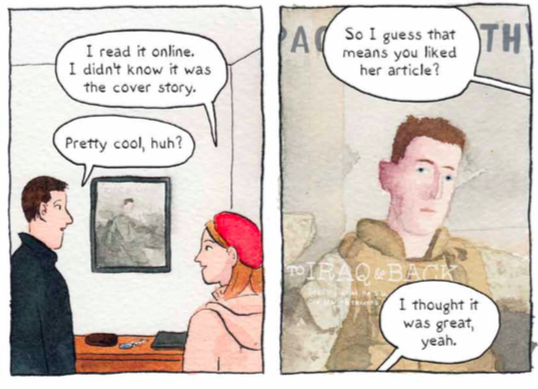 Page 13 panel 6: Pakistan: Hearts and Minds was a suite of stories also made possible by a grant from the Pulitzer Center for Crisis Reporting. 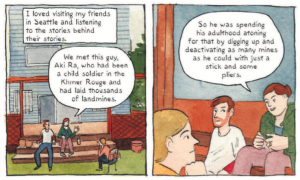 Page 14: Sarah Stuteville wrote about Aki Ra in an article called Enemy Mine: The Story of a Cambodian Veteran's Personal War on Landmines for the Indypendent newspaper in 2006. Hitting the Road: A blog post by Sarah Stuteville written at the start of the 2010 reporting trip with an accompanying short video produced by Chantal Anderson who interviewed Seattle area youth on how the Iraq War has impacted them. All Aboard the Trans-Asia Express: I was planning on posting comics throughout the reporting trip but this is the only one which I had time to do. It eventually became the opening of Rolling Blackouts. 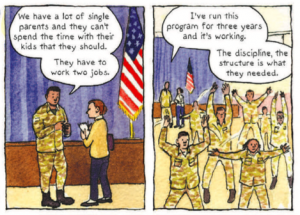 Pages 32-34: Sarah Stuteville's feature article, The Military Solution: Can Junior Cadets Save Troubled Kids?, was published in the Indypendent in 2004. Page 43 panel 8: "It's in the P-I." was a short documentary produced in 2009 by the Common Language Project and the Last Quest on the end of print publication for the Seattle Post Intelligencer. 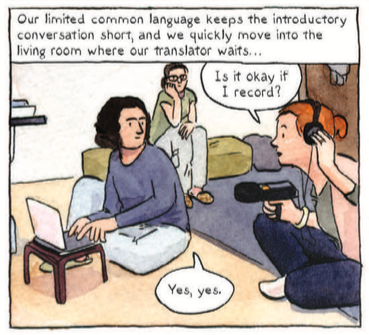 Among the Faithful: A blog post by Sarah Stuteville on faith, featuring Iranian refugees Amin and Mina (whose names were changed for the book but not for the earlier article about them) and observations from Eid al-Adha practices. 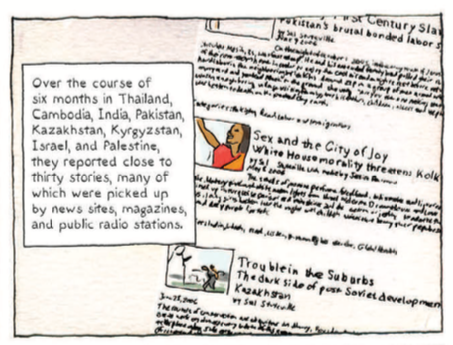 Page 119 panel 8: The Seattle Globalist/Common Language Project reports often on immigration and detention, but a good example is the multimedia reporting project Between Worlds/Behind Bars produced for KUOW. Darkness on the Edge of Town: Blog post by Sarah Stuteville on the disputed city of Kirkuk and KRG capital Erbil. 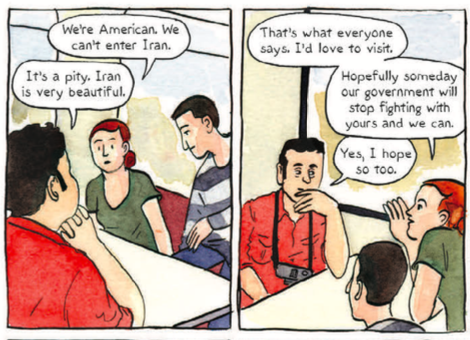 The Quiet American: Why My Generation Should Listen to Iraqi Refugees: Blog post by Sarah Stuteville. With video by Alex Stonehill. Never Going Home: Young Iraqi Refugees Dream of Seattle, Wait in Limbo in Syria: Article originally written for the Seattle Times and video originally published by VJ Movement. Rappers Bring Horror of Syrian Civil War to Life in Lyrics: Article about the Damascus based rap group the Sham MCs referenced on page 275 along with a short video documentary by Alex Stonehill. The Return: Seattle Marine Revisits Iraq: Sarah Stuteville's article on Dan O'Brien, referenced on page 292, published in the Seattle Times Magazine, Pacific NW. The Waiting Room: Comic written and drawn by me using reporting from Sarah Stuteville and Jessica Partnow, originally published on Cartoon Movement, referenced on page 297. Part 4: Was it Worth it?